Batch PDF to TIFF Converter | Convert PDF to TIFF | PDF to TIFF Conversion Tool. Quickly convert PDF document to TIF format. Supports batch PDF to TIF conversion. Supports generate multi page tiff files. Supports outputting result pages to be customized. Supports conversion of vector graphics into tiff files. Supports conversion into 32-bit, 24-bit, 12-bit, 8-bit gray format image. Supports compression of tiff image, such as LZW, PackBits, RLE, CCITT Group3, CCITT Group4 etc. Supports any resolution in the generated Image files. 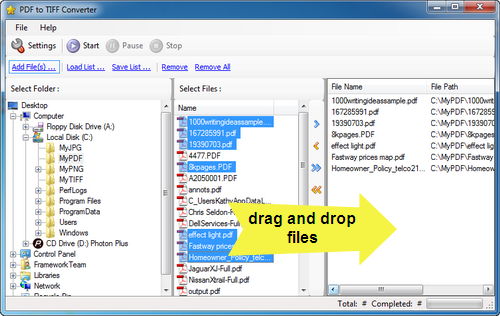 Supports drag and drop of files.